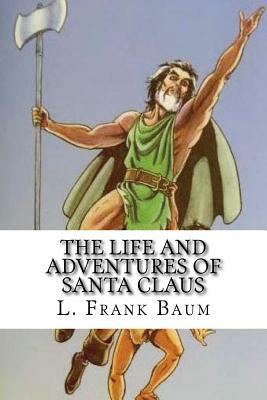 The Life and Adventures of Santa Claus By L. Frank Baum Once, so long ago our great-grandfathers could scarcely have heard it mentioned, there lived within the great Forest of Burzee a wood-nymph named Necile. She was closely related to the mighty Queen Zurline, and her home was beneath the shade of a widespreading oak. Once every year, on Budding Day, when the trees put forth their new buds, Necile held the Golden Chalice of Ak to the lips of the Queen, who drank therefrom to the prosperity of the Forest. So you see she was a nymph of some importance, and, moreover, it is said she was highly regarded because of her beauty and grace. When she was created she could not have told; Queen Zurline could not have told; the great Ak himself could not have told. It was long ago when the world was new and nymphs were needed to guard the forests and to minister to the wants of the young trees. Then, on some day not remembered, Necile sprang into being; radiant, lovely, straight and slim as the sapling she was created to guard. Her hair was the color that lines a chestnut-bur; her eyes were blue in the sunlight and purple in the shade; her cheeks bloomed with the faint pink that edges the clouds at sunset; her lips were full red, pouting and sweet. For costume she adopted oak-leaf green; all the wood-nymphs dress in that color and know no other so desirable. Her dainty feet were sandal-clad, while her head remained bare of covering other than her silken tresses. We are delighted to publish this classic book as part of our extensive Classic Library collection. Many of the books in our collection have been out of print for decades, and therefore have not been accessible to the general public. The aim of our publishing program is to facilitate rapid access to this vast reservoir of literature, and our view is that this is a significant literary work, which deserves to be brought back into print after many decades. The contents of the vast majority of titles in the Classic Library have been scanned from the original works. To ensure a high quality product, each title has been meticulously hand curated by our staff. Our philosophy has been guided by a desire to provide the reader with a book that is as close as possible to ownership of the original work. We hope that you will enjoy this wonderful classic work, and that for you it becomes an enriching experience.